The Greg Norman Bolt Stretch polo will be a perfect addition to your wardrobe. The stretch fabric offers a comfortable fit while also allowing you to move freely. The fabric is also easy to care for and resistant to shrinking and wrinkles. Features of the Bolt polo include UV protection against harmful sunrays and PlayDry moisture wicking technology that draws sweat away from the skin to keep it cool and dry throughout the day. 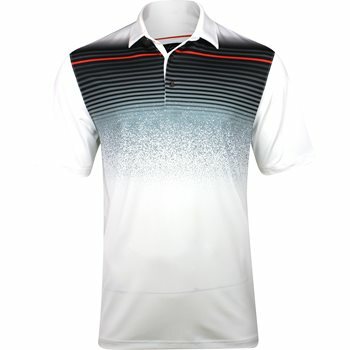 This fashionable polo has a tailored collar, pixel ombre engineered print, a raised Shark logo at the right back yoke and a three button placket that allows closure adjustability.